Complete Entries for this weekends Mondo Elite Invitational. The meet will feature an Elite 60m Dash, 60m Hurdles, 400m Dash, and Mile with athletes from North Carolina, South Carolina, Florida, Georgia, Texas and Tennessee! 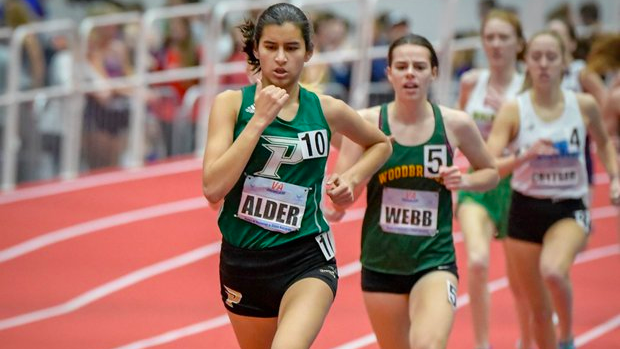 2	Dreikosen, Aubry	Green Hope	5' 4.50"
3	Alexander, Kennedy	Mallard Creek	5' 4"
5	English, Eve	Olympic	5' 3"
10	Coleman, Destiny	Parkland	5' 0"
11	Schmitz, BK	Weddington	5' 0"
12	Rossi, Alayna	Weddington	5' 0"
13	Fisher, Annalise	Weddington	4' 10"
14	Bryant, Gimelly	Harnett Central	4' 10"
15	Wynns, Zoe	Green Hope	4' 10"
16	Smith , Caroline	Cuthbertson	4' 10"
17	Travis, Quinn	Marvin Ridge	4' 10"
18	Strother, Carson	Olympic	4' 10"
19	Mcintyre, Brianna	Cuthbertson	4' 8"
20	McGuire, Jayla	Unattached	4' 8"
21	Thomas, Stephanie	Southeast Raleigh	4' 8"
22	Mallare, Ashley	Green Hope	4' 8"
23	Hines, Jaden	Mallard Creek	4' 8"
24	Borgelt , Karyn	Cuthbertson	4' 8"
25	Adams, Nakia	Walter M. Williams	4' 6"
1	Bernard, Idris	Mallard Creek	6' 8"
2	henry, tanner	Unattached	6' 6"
3	Parks, Joshua	Brown, A. L.	6' 6"
4	Gentry, Clayton	Randleman	6' 4"
5	Lucas, Dillan	West Forsyth	6' 4"
6	Schronce, Jesse	Alexander Central	6' 2"
7	Ngwenah, Wonderful	Harding	6' 2"
8	Kaakati, Adam	Green Hope	6' 2"
9	Cokley, Quinn	Marvin Ridge	6' 2"
11	Galla, JT	Unattached	6' 0"
12	Williams, Dominic	Southeast Raleigh	6' 0"
13	Armstrong, Evan	Weddington	6' 0"
14	Riegel, Mark	Cardinal Gibbons	6' 0"
15	Neville, Laderrick	Northern Durham	6' 0"
16	Grant, Trevor	Cuthbertson	6' 0"
17	Phelps, Christan	Cuthbertson	6' 0"
18	Byrum, DJ	Marvin Ridge	6' 0"
20	Parker, Bryce	Mallard Creek	5' 10"
21	Lockley, Tanoah	Southern Lee	5' 10"
22	Jones, Chase	Weddington	5' 10"
23	Poag, Ivan	Davie County	5' 10"
24	Williams, Jahkee	Nash Central	5' 10"
25	Hicks, Jack	Marvin Ridge	5' 10"
26	Pierson-Mace, Za'hier	Reagan	5' 10"
27	Cuthrel, Isaiah	Davie County	5' 8"
28	Ryle, Isaiah	Mooresville	5' 6"
29	Brown, Joey	Charlotte Country Day School	5' 4"
30	Burgess, Andrew	Southeast Guilford	5' 0"
1	Absher, Lindsay	West Forsyth	13' 1"
3	Lane, Maura	Panther Creek	11' 6"
4	Eberhard, Sami	Weddington	11' 3"
5	Crandall, Isabel	Marvin Ridge	11' 0"
6	Campbell, Miranda	Unattached	10' 10"
7	Richardson, Ally	Pine Lake Prep	10' 9"
8	Studney, Ava	Cuthbertson	10' 9"
9	Amsberry, Skyela	West Forsyth	10' 6"
10	Walker, Madison	Unattached	10' 6"
11	Stone, Emma	Marvin Ridge	10' 6"
12	Lloyd, Rachel	Unattached	10' 6"
13	Baumgardner , Lainie	Cuthbertson	10' 3"
14	McCarter, Maggie	Providence	10' 0"
15	Rhodes, Samia	West Forsyth	10' 0"
16	Wood, Elizabeth	Mount Tabor	9' 6"
17	Shockley, Maddie	Green Hope	9' 6"
18	Ochsner, Isabella	Marvin Ridge	9' 6"
19	Fisher, Annalise	Weddington	9' 6"
20	Tucker, Payton	Mooresville	9' 3"
21	Gifford, Kayla	Green Hope	9' 0"
22	Hippert, Neva	Wheatmore	8' 6"
23	Uzun, Polyna	Green Hope	8' 6"
24	Hunter, Margaux	Millbrook	8' 6"
25	Karriker, Rebecca	Mooresville	8' 3"
26	Loucks, Claire	Croatan	8' 3"
27	Rossi, Jacquelyn	Weddington	8' 0"
28	McCoury, Talia	Providence	8' 0"
29	Warner, Elizabeth "Liza"	Davie County	8' 0"
1	Evans, Spencer	Lake Norman	15' 6"
2	Keech, Tommy	Unattached	14' 1"
3	Cargnel, Ben	Marvin Ridge	14' 0"
5	Malachowski, Walker	Mount Pleasant	13' 3"
6	Lewis, Carter	Unattached	13' 0"
7	Basinger, Ethan	Marvin Ridge	13' 0"
8	Malatlian, Tristan	Reagan	13' 0"
9	Callis, Nick	Weddington	12' 8"
10	Bulaitan, Elijah	West Forsyth	12' 6"
11	Hodge, Brendon	Croatan	12' 3"
12	Seidman, Aidan	Providence	12' 0"
13	Works, Matthew	Marvin Ridge	12' 0"
14	Hartis, Landon	Reagan	12' 0"
15	Stone, Michael	Millbrook	12' 0"
16	Mourdakhanian, Sergiy	Cuthbertson	11' 9"
17	Knox, Tanner	Providence	11' 6"
18	Woehr, Andy	Southwest Guilford	11' 6"
19	Scrattish, Jacob	Reagan	11' 6"
20	Evans, Drew	Lake Norman	11' 6"
21	Jones, Chase	Weddington	11' 0"
22	Trent, Matthew	Providence	10' 6"
2	Parsons, Jayda	Unattached	18' 4"
3	Hee, Olivia	Providence Day School	18' 0"
4	Black, Zariyah	Unattached	17' 10"
5	Renner, Addie	Myers Park	17' 7.75"
6	Simington, Amari	Parkland	17' 5.25"
7	Brown, Jayla	Unattached	17' 4.25"
11	Phillips, Asia	West Forsyth	16' 10"
12	Cardwell, Eliza	Providence Day School	16' 10"
13	Evans, Na'Zyia	Olympic	16' 9.50"
14	Stevenson-Damon, Jadai	Parkland	16' 8.50"
15	Hill, Destiny	West Forsyth	16' 8"
16	Archie, Imunique	North Mecklenburg	16' 7.50"
17	Mack, Alana	North Mecklenburg	16' 6.75"
18	Woodson, Veronique	Hoke	16' 6.50"
19	McAuthur, Cierra	Smith, E. E.	16' 5"
21	Flynt, Ajile	West Forsyth	16' 4.25"
22	Cain, Gabrielle	Parkland	16' 3"
23	Walker, Ty'Nasia	Olympic	16' 3"
24	Green, Jada	Hillside	16' 2"
25	Holmes, Skylar	Unattached	16' 1"
26	Faucette, Jydia	Cummings	16' 0"
27	Williams, Laila	High Point Central	16' 0"
28	Tillman, Brianna	Unattached	15' 9"
29	Sandlin, Sarah Margaret	Weddington	15' 9"
30	Harrell, D'Nahjah	Mooresville	15' 7.50"
31	English, Eve	Olympic	15' 3"
32	McLain , Jade	Cuthbertson	15' 1"
33	Spearman, Santana	Providence Day School	15' 0"
34	Williams, Katriel	Marvin Ridge	14' 11"
35	Howard, Naudika	Nash Central	14' 9.50"
36	Imhof, Sophie	Marvin Ridge	14' 9"
37	Swann, Janelle	Reagan	14' 6"
38	Thompson, Iyonna	Mallard Creek	14' 5"
39	McCullough-Perry, Ashlin	Reagan	14' 1"
40	Brown, Illiana	Nash Central	14' 0"
42	Bullock, Symone	Nash Central	13' 9.50"
44	Mosher, Hanah	Asheville	13' 5"
45	Lewis, Kyla	Reagan	13' 5"
2	Brockman, Joshua	Unattached	23' 6"
4	Bennett, Braydon	Unattached	22' 3"
5	Lyles, Devin	Southern Lee	21' 10.50"
6	Palmer, Kameron	Mount Tabor	21' 6"
7	Payne, Jaymond	Reagan	21' 1"
8	Wilkins Jr., Vincent	Parkland	21' 0"
9	Eziri, Kelechi	Providence Day School	20' 11.50"
10	Mayer, Sekani	Mount Tabor	20' 11"
11	Purvis, Jordan	Southern Durham	20' 7.75"
12	Woodson, Marquize	Hoke	20' 6.75"
13	Black, Will	Weddington	20' 5"
14	Evans, Jeremy	Smith, E. E.	20' 4.50"
15	Phelps, Christan	Cuthbertson	20' 4.50"
16	Grant, Trevor	Cuthbertson	20' 4"
17	Chapman, Isaiah	Southeast Raleigh	20' 3"
19	Thompson, Tyler	Weddington	20' 1.75"
20	Hicks, Jadiyn	Reynolds, R. J. 20' 1.50"
21	McEntee, Evin	Marvin Ridge	20' 0.50"
22	Hollingsworth, Gabriel	Reagan	20' 0.50"
23	Poag, Ivan	Davie County	19' 10.50"
24	Rhody, John	Harnett Central	19' 10"
25	Pierson-Mace, Za'hier	Reagan	19' 9.50"
26	Beard, Bryce	Southeast Raleigh	19' 9"
27	Riegel, Mark	Cardinal Gibbons	19' 8.50"
28	Jean-Louis, Andey	High Point Central	19' 7"
29	Cuthrel, Isaiah	Davie County	19' 7"
30	Rozier, Isaiah	Hoke	19' 6"
31	Bowers, Samuel	Parkland	19' 5.50"
33	Brady, Samuel	North Lincoln	19' 4.50"
34	Alsbrooks, Trey	Weddington	19' 4.25"
35	Birchett, Malik	Mooresville	19' 3"
36	James, David	North Mecklenburg	18' 9.50"
37	Morgan, Dominic	Hillside	16' 9"
38	Addo, Malik	Olympic	16' 8"
39	Kirk, Shawn	Smith, E. E.	16' 7.50"
40	Johnson, Brandon	East Forsyth	16' 2"
1	Evans, Na'Zyia	Olympic	38' 4"
2	Mumford, Ija	Parkland	38' 3"
3	Holmes, Skylar	Unattached	36' 5"
4	Hope, Jasmine	Unattached	36' 1.50"
5	Phillips, Asia	West Forsyth	36' 0"
6	Faucette, Jydia	Cummings	35' 10.75"
7	English, Eve	Olympic	35' 4.50"
8	Woodson, Veronique	Hoke	35' 0"
9	Cardwell, Eliza	Providence Day School	35' 0"
10	Simington, Amari	Parkland	34' 11.50"
11	Minga-Perry, Madison	Carver	34' 6"
12	Hill, Destiny	West Forsyth	34' 6"
13	Williams, Laila	High Point Central	34' 0"
14	Correa, Olivia	North Lincoln	33' 9.75"
15	McDuffie, Macey	Weddington	32' 9"
16	McLain , Jade	Cuthbertson	32' 9"
17	Gilliland, Katie	Western Guilford	32' 8"
18	McCahill	, Nikole	Lake Norman	32' 0"
19	Hayes, Maiya	Cuthbertson	31' 10.25"
20	Hedgepeth, Myka	Nash Central	31' 10"
21	McCullough-Perry, Ashlin	Reagan	31' 9"
22	Turner, Payton	North Lincoln	31' 7"
23	Bradley, Alena	Croatan	31' 0"
24	Mcintyre, Brianna	Cuthbertson	29' 10.75"
25	Howard, Naudika	Nash Central	28' 5.25"
27	Martinez, Iysis	Cummings	27' 6"
28	Griffin, Annalise	Reagan	27' 6"
3	Poag, Ivan	Davie County	44' 5.50"
4	Woodson, Marquize	Hoke	43' 9.50"
5	Parker, Bryce	Mallard Creek	43' 3.75"
6	Parker, Tashaun	Providence	43' 3"
7	Phelps, Christan	Cuthbertson	43' 3"
8	Chapman, Isaiah	Southeast Raleigh	43' 1"
9	Eziri, Kelechi	Providence Day School	42' 9"
10	Stone, Jonathan	Southern Lee	42' 3"
11	Grant, Trevor	Cuthbertson	42' 0.50"
12	Dowell, Chandler	Parkland	41' 8"
13	Rozier, Isaiah	Hoke	41' 7.75"
14	Schronce, Jesse	Alexander Central	41' 7"
15	Campbell, Tristan	Mount Tabor	41' 3"
16	Whitaker, Andrew	Smith, E. E.	40' 9.25"
17	Byrum, DJ	Marvin Ridge	40' 9"
18	McEntee, Evin	Marvin Ridge	40' 7.75"
19	Birchett, Malik	Mooresville	40' 5"
20	Jean-Louis, Andey	High Point Central	40' 0"
21	Alexander, Keilan	Mallard Creek	39' 6"
22	Mckoy, Devin	Northern Durham	39' 4"
23	Payne, Jaymond	Reagan	39' 2.50"
24	Jordan, Spencer	Green Hope	37' 0.75"
25	Scrattish, Jacob	Reagan	36' 9.50"
26	Ikwechegh, Okenna	Reagan	36' 8.75"
2	Shain, Emily	Lincolnton	40' 7"
3	Watkins, Makayla	Western Guilford	40' 2.25"
4	Griffin, Destiny	West Forsyth	39' 6"
5	Green, Jada	Hillside	38' 11"
6	Judd, Autumn	Southeast Raleigh	38' 9"
7	Freeman, Sydney	Millbrook	38' 2"
8	Gaither, Tyler	Reagan	36' 9"
9	Cartner, Erin	Davie County	35' 1.50"
10	Charles, S'Khaja	Unattached	34' 8.50"
11	Abhulimen, Ono	Mount Tabor	34' 1"
12	Mercer, Erika	Millbrook	34' 0"
13	Crumpler, A'riana	Unattached	33' 0"
14	Desir-Moxeaw, Rolanda	High Point Central	33' 0"
15	Sears, Renara	Olympic	32' 6.75"
16	Legins, Jaree	Reynolds, R. J. 31' 9"
17	Diggs, Supreme	Southern Guilford	31' 8"
18	Robinson, Asia	Olympic	31' 6"
19	Davis, Alexandria	West Johnston	31' 5"
20	Ratchford, Madison	Alexander Central	31' 3.25"
21	Wilson, Rihonna	Davie County	29' 0"
22	Jiggetts, Sandra	Hillside	28' 11.75"
23	Miller, Samantha	Mount Tabor	28' 8"
25	Holden, Erin	Marvin Ridge	28' 3"
26	Medders, Campbell	Marvin Ridge	27' 8"
27	Harris, Jaeda	Mallard Creek	25' 8"
28	Hamilton, Laysie	Southern Lee	25' 0"
29	Zullo, Ashton	Mooresville	22' 0.75"
30	McArthur, Makaria	Mooresville	21' 6.75"
31	Madison, Amaya	Mooresville	20' 8.75"
32	Hicklin, Lia	Hillside	20' 0.50"
1	Ellis, Mason	West Forsyth	60' 3.50"
2	Edelen, Timon	Unattached	55' 8"
3	Soorus, Jake	North Lincoln	52' 3.50"
4	Myers, Nathan	West Forsyth	51' 1"
5	Williams, Jeremiah	Reynolds, R. J. 48' 6"
6	Stajos, Jack	Charlotte Country Day School	48' 5"
7	Partridge, Dominique	Chapel Hill	47' 9.50"
8	Mack, Dontae	Olympic	47' 5"
9	Strickland, Lyndon	Alexander Central	47' 2.75"
10	Shean, Alfred	Unattached	46' 1"
11	Jenkins, Nathan	Unattached	46' 1"
12	Whitt, Dillon	Unattached	46' 1"
13	Wright, Xavier	Unattached	46' 1"
14	Brady, Samuel	North Lincoln	45' 8"
15	Mock, Alec	Weddington	45' 3"
16	Stanfield, Tykel	Cummings	44' 0.50"
17	Billiard, David	Covenant Day School	42' 4"
18	Ross, Alex	Green Hope	41' 9.50"
19	Williams, Rashad	Southeast Raleigh	41' 8"
20	Hankins, Quinten	Southeast Raleigh	41' 6"
21	Oxendine, Bennie	Hoke	41' 1.25"
22	Brownfield, Lincoln	Marvin Ridge	39' 8"
23	Williams, Kamari	Southeast Raleigh	39' 5"
24	Holland, Dontrell	Parkland	38' 9"
25	Heine, Jagger	Marvin Ridge	38' 5"
26	Spratling, Reggie	Mooresville	37' 10.75"
27	Eanes, Kristian	Hillside	37' 9"
28	Gill, Larry	Hillside	31' 6.25"
29	Rojas, Ivan	Thomasville	21' 3"